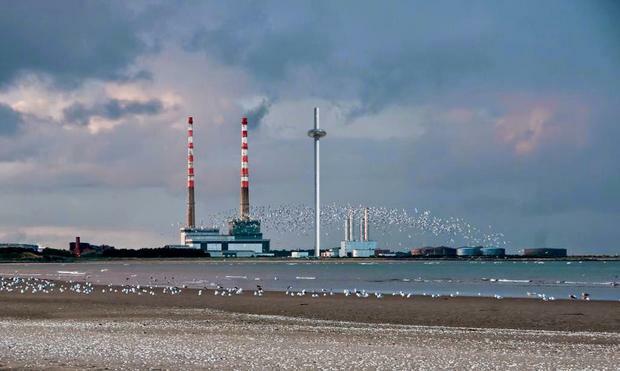 Developer Harry Crosbie is planning for an ambitious tourist "lookout" tower at the site of the Poolbeg chimneys. Mr Crosbie yesterday said he had a proposal to develop a tourist site beside the iconic chimney stacks in Dublin 4, and he has met with a number of stakeholders in recent days. But he said the decision would depend on "public opinion". The businessman, who was behind the construction of the Point Theatre and the Bord Gáis Energy Theatre, said that he had met with architects, council representatives and had spoken with the CEO of ESB. The stacks at Pigeon House Road, Dublin 4, had previously been threatened with demolition but the ESB decided to carry out remedial work in recent years. Dublin City Council had recently sought expressions of interest in relation to the adjoining seven-acre site and it is understood there are five parties interested in developing the listed buildings including a Georgian hotel and the ESB power station. "The site is owned by Dublin City Council, who are seeking a partner to restore the listed buildings," Mr Crosbie's spokesperson said. "The deal [to develop a lookout tower] would be with whoever gets this contract." It's understood Mr Crosbie has been in discussion with the firm that designed the London Eye and Brighton 360, which he said has agreed to work with him on the proposed lookout. David Browne of RKD Architects told the Irish Independent he had begun working on the project. The plan would incorporate the landmark thermal station chimneys, built in 1971, which were at one point the tallest structures in Ireland. The generating station ceased operation in 2010, and a brand new incinerator was completed in 2017. A spokesperson for Mr Crosbie told the Irish Independent the project is at its earliest stages, there is no planning application lodged, and it doesn't yet have a name.